Tandem on the Top 80! Recently, an interesting article appeared in Paraglider Magazine entitled 'Are Thermals BAD?' While I agree with some of the points made by the authors, the overall feeling I got from the article was that PPG pilots should avoid thermals. I agree that this may be true for some PPG pilots, but I have seen that with adequate training and understanding, thermalling and motoring can be combined to give the pilot the best of both worlds. In the simplest terms, a great deal of training is needed to learn how to thermal safely. New PPG pilots are often trained by schools where the average lesson package is a 2-4 day curriculum that includes: an overview of the equipment; a few kiting basics; a look to see if the wind is blowing; and a few solo flights. Given a perfect environment, these new PPG pilots may now be ready to fly the smooth air of early morning or late evening on their personal property. However, these schools are not teaching to the certification level established by the United States Powered Paragliding Association (USPPA). According to the USPPA, after 2 days of flying, the pilots are not even ready to fly on their own and they are certainly not ready to begin thermalling with their motor. Full USPPA certification for PPG 2 requires a much greater investment of time, energy and fiscal, by both the student and the instructor. Certification requires a minimum of 5 days of training, 25 flights, specific skill development and demonstrations of proficiency that are beyond what can be learned in just a couple of days. What are the benefits of this expanded training program? It results in better, safer, more knowledgeable pilots. That’s better for the pilot and better for the sport overall. As Powered Paragliding advances, PPG pilots are beginning to experience the same issues that hang gliders went through in the past. Long before our sport existed, hang glider pilots learned that their ability to establish and maintain flying sites was directly influenced by society’s view of their ability to fly knowledgeably and safely. Training standards had to be developed and enforced to maintain hard won flying sites. PPG flying sites are now coming under pressure, especially in suburban and urban areas, and these sites need to be protected as well. Furthermore, there are always those pilots that will push our sport’s current envelope. Many advanced PPG pilots will choose to thermal. Most pilots do not become proficient at soaring in thermals, convergence or ridge lift until they have flown for many, many hours, over the course of many months or even years. These pilots are often well beyond the intermediate level by the time they thermal well. As such, they have earned a much deeper understanding of the weather and flying conditions than the beginner or novice pilot can have. The advances of these pilots, combined with their determination to understand and share their successes and failures, allow the sport to expand for the rest of us. So in answer to “Are Thermals BAD? The answer is categorically, NO. However, thermal flying is different than flying in smooth air. You will need to expand your skills and your margin of safety to thermal successfully. All pilots spend time watching for the right conditions. That is the mark of a good pilot. I have driven all the way from California to Colorado on a powered paragliding trip, yet I never took the glider out of the bag due to high winds. I had to settle for flying the river (denial). Let’s face it - Parawaiting Happens. Whether you are a PPG or a free flight pilot, if you want to soar in thermic conditions, you need to be aware of the dangers and heed the signs of air that is too strong. Since thermalling pilots use the more active part of the day when thermals and wind are produced from the sun's heating energy, they need to understand the dangers of flying in more dynamic conditions. 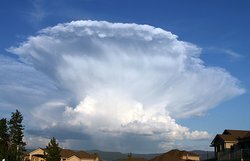 A thorough understanding of weather allows a pilot to determine the amount of lift that will be present, whether it is appropriate for their skill level, and how that lift will be affected by wind and other factors. Every time a PPG or a free flight pilot desires to use thermals or convergence to stay aloft, they must look at what the balloon soundings reveal about winds aloft, lapse rates, atmospheric pressure, temperature forecasts and surface observations as well as glancing at the current conditions just outside their door. Although it has been said that most PPG pilots spend much of their time flying near the ground, if they are looking to find thermal lift on an active day, they need to climb to an appropriate altitude just as a free flight pilot must. You DO NOT want to fly near the ground during the active part of the day. If flying close to the ground is what you want to do, fly only early or late in the day when there is little thermal heating and the winds are light. Both powered and unpowered paragliders can launch from a slope, gaining altitude quickly over the ground by flying away from the terrain. 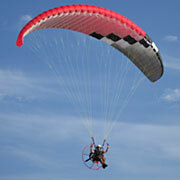 PPG's can also launch from flat ground and climb to a comfortable altitude in a relatively short period of time. All pilots are susceptible to the dangers of dust devils and turbulence caused by thermals, especially when they are close to the ground. I have often seen free flight pilots 'scratching' along a ridge or rock face looking for thermals. I will tell them to give themselves room for a potential collapse to recover, or to glide away from the terrain in the event of strong sink. Besides, you can't even turn in a thermal if you are right next to the ground! A powered paraglider has an advantage in that it can motor to a relatively safe altitude in a matter of minutes while keeping an eye open for dust devils. They also have the advantage of being able to choose to initially fly over terrain with little thermal activity, until they have enough altitude over the ground to use lift safely. The powered paraglider pilot has the distinct advantage during landing! A thoughtful pilot will place four or more flags around the launch-landing zone. Upon approach, the pilot can observe the winds from a safe altitude and decide whether the winds in the LZ are favorable for their landing. If not, they can simply apply power and go around again! The PG pilot has only one chance to do a good approach and landing. I can say from personal experience that this is a huge benefit for the PPG pilot in thermic conditions - I have gone around as many as three times before I observed that the flags in my landing zone were all favorable for a safe descent. No one likes a downwind landing! An important factor in any flight discussion is the level of wing flown (the DHV or AFNOR rating given to any wing that has been certified). While many pilots choose to fly intermediate or advanced wings to get a better glide, most PPG pilots do not need this performance advantage - they have power! They can simply add thrust from their motor, and make their glide infinite. In a paraglider, nobody is really going that fast, and to think that a hotter ship will give you an advantage is really kidding yourself. A lower rated glider will give you the confidence to fly in stronger conditions without worrying about keeping the wing inflated. I agree with the authors of “Are Thermal BAD?” that a pilot shifting his weight away from the collapsed side of the wing helps to counteract the wing’s natural tendency to turn towards the collapsed side, but it does NOT help to repressurize the soft wing. A pilot should lean away from a collapse when the glider’s resulting turn would cause a collision with another pilot or the terrain. 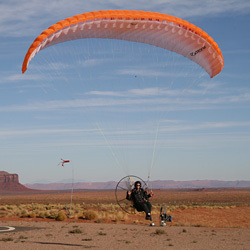 In this case, a powered paraglider harness with a limited ability to weight shift, will stay much more upright, counteracting the natural tendency of the wing to turn towards the collapse. However, when you are in clear airspace, rolling towards the depressurized side of the wing and allowing the glider to drop into a turn in that direction, will rapidly repressurize the soft wing, often preventing the collapse altogether. In free flight harnesses and some PPG attachment designs (some J-bars) there is a greater ability to weight shift the harness. In this case weight shift is an advantage as it allows you to “roll with the punches”. Collapses are a reality in thermic conditions, and it's true that most powered paragliders have very limited weight shift ability, but if your pilot skills are good, this does not have to be a significant issue. Relying on the harness to transmit information about pressure changes can be helpful. It is certainly easier to 'feel' the subtle nuances of pressure changes in a free flight harness, but this type of ‘feel’ is not imperative for using thermal or ridge lift efficiently. The information transmitted through the brakes, to the PPG pilot is more. A good pilot will use the brakes to sense the pressure changes in their glider and compensate to keep the glider flying well. It’s true that the PPG pilot is more upright during flight than a free flight pilot. However, I do not think this is a significant issue. I have never had any trouble seeing where I am going or even the wing for that matter. Most PPG pilots launch looking straight up at their wings, and I doubt they feel their visibility is impaired. Besides, a pilot should not be looking up at their glider during flight! You should be looking where you are going - remember the prime directive in aviation - SEE AND AVOID! Feel your glider through some gentle pressure on the brake toggles, and respond to pressure changes as is appropriate. You will never see your glider collapse before it happens. Instead, watch where you are going and feel the pressure in the brakes to monitor the canopy! While the powered paraglider pilot has more drag due to the cage and the propeller, I can't see where penetration is even an issue, since the powered paraglider again has a distinct advantage - POWER! The pilot can simply add thrust and climb or maintain, even in sinking air. This may be more of a factor in wind, but if the wind is blowing hard enough to be a concern, you may want to reevaluate whether you launch into these conditions in the first place. Soaring flight in a paraglider is an art. Powered paragliding is a great way to enjoy flying for more hours of the day. Many times, I have found a ridge where the wind is producing a broad, smooth lift band, but there is nowhere to launch. With a PPG, I can launch, sometimes from miles away, fly to the ridge and shut off the motor and enjoy soaring with the birds. Other times, out in the high desert on the right day, I can see hawks circling lazily in gentle thermic lift, but again, there is no launch for miles. With my motor, I can launch and quickly climb to a safe altitude to search for the lift. I turn my motor off when thermalling or flying the ridge, so noise is not a factor. If your motor does not start easily in the air, you might want to think about getting an electric starter. When my motor is off, I can pull my earmuffs away from my head to hear my vario and use the thermal lift quite well. If I am sinking out, I simply restart my motor, and off I go looking for another thermal. Using thermal lift to ascend does not mean risking your life in turbulent conditions. Yes, when the day is active, all pilots risk the stray dusty during launch. However, a pilot that knows their limits, uses thoughtful weather observations, makes conservative choices and utilizes greater skill, will find that a motor can be a means to enjoy more airtime and even allow a pilot more opportunities to refine their skills in the art of soaring! 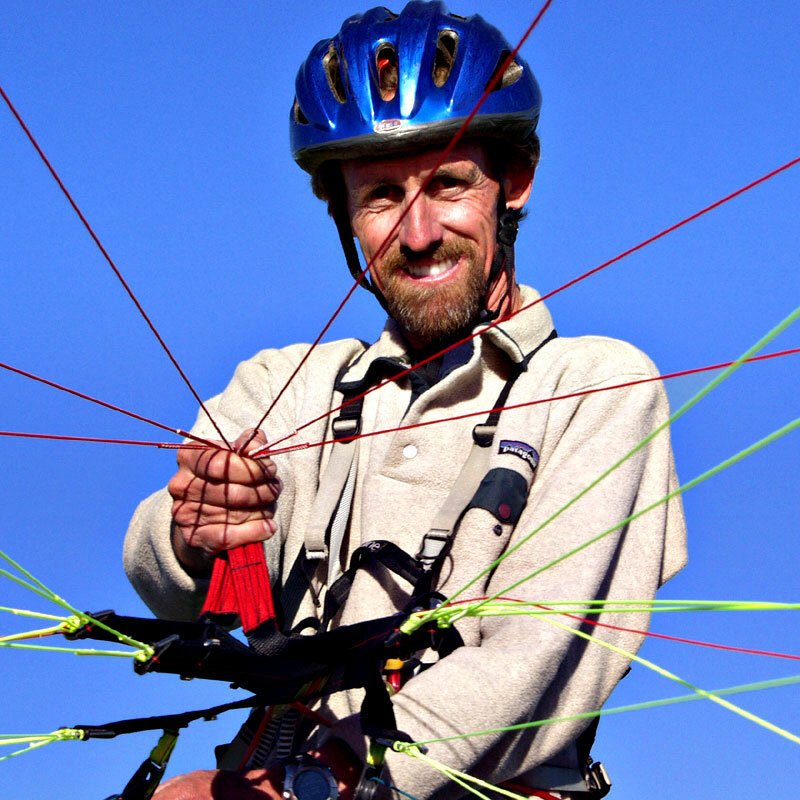 Chad Bastian is the owner/operator of www.AmericanParagliding.com, www.Miniplane-USA.com, www.TrikeBuggy.com and www.WSC-Trike.com. He previously owned and operated www.FlyAboveAll.com for 12 years in Santa Barbara, CA. Our flight school was established in 1980 and has expanded from its roots in hang gliding to become one of the largest ultralight schools in the country – and has trained thousands of pilots. Chad has been flying for over 22 years now and has been a member of the USHPA Paragliding and USPPA Powered Paragliding Teams. He is a Certified Flight Instructor, Tandem Administrator and Instructor Administrator for the USPPA and a Master Rated Pilot, an Advanced Instructor, Observer, Tow Administrator, Instructor Administrator and Advanced Tandem Instructor for the USHPA, as well as a Certified Flight Instructor of WSC-Trikes with the FAA.